Have you ever wanted to set a song from your iPhone music library as your ringtone directly from the phone? AnyRing, an app from Cydia, allows you to do this. With AnyRing you can set any song from your iPod library as a ringtone or change the sound of receiving text message or the email sound, all this can be done directly from the iPhone. AnyRing has a ton of customization for your ringtones/sound needs. It allows you to transfer or receive sounds via Bluetooth. You can also set specific ringtones/songs to specific contact from your contacts list, or play random song from your iPod library as well. AnyRing not just allow you to choose ringtone from your iPod library, but it also lets you record your own sound or download any audio from a YouTube video and use it as your own personal ringtone or sound notification for email or SMS. 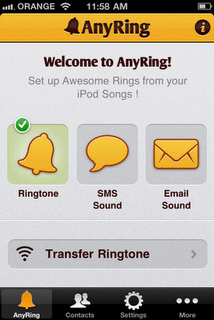 With AnyRing you can easily select any song on your iPod (or record your own voice) to play as a ringtone. iPod Ringtone even lets you select the starting/ending point in the song to play when the ringtone is played in real-time. Does not require any audio conversion of any type! * New – Can now transfer Ringtones over Bluetooth ! You can find AnyRing in Cydia and download the trial for 10 days or purchase the full app for just $3.99 using PayPal.